OK, I too am inspired by Empire State Development Corporation CEO Marisa Lago's folksy style, explaining that value engineering is just like getting a four-burner stove instead of a six-burner stove. Noticing New York's Michael D.D. White demolished Lago's arguments, suggesting some very helpful rules regarding both kitchen renovations and megadevelopments. So let's talk "economic and fiscal impact analysis." That was the exercise by which the New York City Economic Development Corporation (NYC EDC) concluded that Atlantic Yards would bring more than half a billion dollars in revenue to the city over 30 years, a figure touted enthusiastically by NYC EDC president Seth Pinsky at Friday's AY oversight hearing. I don't want to be accused of "blocking the program, with these complicated questions" (to quote the disrespectful Rev. Herbert Daughtry), so let me break it down. 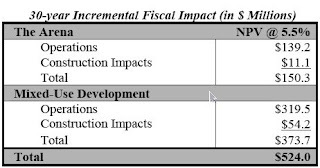 To NYC EDC, "economic and fiscal impact analysis" concerns revenue you take in. That's it. No costs, no subsidies. OK, I have just conducted an "economic and fiscal impact analysis" regarding my personal future revenue stream. After 20 years, I conclude, I will easily become a millionaire. Oops--I forgot to factor in rent, food, and tons of other things, including taxes. If I don't pay taxes, well, I go to jail. It renders my "economic and fiscal impact analysis" slightly flawed. Didn't this kind of shoddy math lead to our economic meltdown? At one point, Pinsky even called the NYC EDC's exercise a cost-benefit analysis, even though it didn't factor in direct subsidies from the city (at that point, $100 million; now, $205 million), indirect subsidies (e.g., tax exemptions), and increased public costs to provide services. I asked NYC EDC spokesman David Lombino when a new NYC EDC analysis was coming, and he said it would be soon. I also asked about the methodology--whether it would be a true cost-benefit analysis--and didn't get an answer. NYC EDC's Lombino told WNYC's Matthew Schuerman that the IBO report was incomplete because it considered only the economic impact of the arena rather than the project as a whole. Fair enough, especially because the IBO applied all the direct subsidies to the arena. But the IBO was unable to conduct a cost-benefit analysis for the project as a whole, saying in its September 2005 report it was limited by methodological challenges. In its report, NYC EDC didn't even try. It just added up new revenues for the project as a whole. And even that strategy has its flaws. Arena revenues are overstated, as I suggest below. And the operations of the mixed-use development likely would generate far fewer taxes than estimated. Why? For one thing, there no longer would be 2 million square feet of office space, which NYC EDC estimated would generate some $87 million in revenue. Sure, there's an office building on the boards with about 650,000 sf, but there's no market now, and maybe never. For another, NYC EDC counts $132 million in new revenue from the income taxes of new residents. Forest City Ratner consultant, sports economist Andrew Zimbalist, also counted income taxes, in a report that triggered my $6 billion lie post. The Empire State Development Corporation, in its own flawed fiscal analysis, didn't count income taxes. No one should. As James Parrott of the Fiscal Policy Institute told me, "I don't know of any serious cost-benefit analyses of mixed-used economic development projects that count the taxes of residents." Both the NYC EDC and IBO analyses suffer from fundamental flaws regarding arena revenue, as I pointed out in February. Both assumed that 30% of New Jersey season ticket holders would be retained. However, as I pointed out, there's reason to believe the team now has a lower attendance base, thus sending a smaller percentage of New Jersey-based fans to Brooklyn and lowering new revenues for New York City and State. Also, both analyses assumed that both the Meadlowlands arena would close and there would be no new arena in Newark, thus making it easier to book events at the Brooklyn arena. However, the Prudential Center in Newark is already open.